Verken de hoogtepunten van Efeze tijdens een kleine groepstour met retourtransport vanuit de haven van Kusadasi. Bezoek topattracties zoals de oude stad Efeze, het Huis van de Maagd Maria, de Isabey-moskee en de tempel van Artemis. Uw gids biedt een historische context voor elke bestemming en geeft u vervolgens de tijd om onafhankelijk rond de sites te lopen, een touroptie die het beste van beide werelden biedt. This was a great tour and our guide was great with historical info. The only thing we didn't like was when they took us to the leather coat factory and the ceramic store. I think this was totally unnecessary and no one bought anything. This should have been explained before we booked the tour. Although our confirmation said 830 am pick up, the ship didn't get in until 10 am. The driver was there at 11 am with all our names on the sign. There were 4 couples that booked the same tour. The van was comfortable and air conditioned. The guide was very knowledgeable, and the tour was amazing. Kemal Sendikici was an exceptional guide who knew the history, customs and culture of the port, Ephesus the Virgin Mary shrine and its surrounding. Great job well done. Ephesus visit is not to be missed opportunity. It is probably the best preserved Roman ruins anywhere outside Rome. It was interesting to visit Mother Mary's house and the archeological museum in Selkuk. However our tour guide Orkan was a little disappointing as he would stand in a shade, give us an overview and tell us to go see sites ourselves, while other guides would walk with their clients and explain significance of the sites. We were met at the cruise dock by Okrom out tour guide for a wonderful four hours. He is a most professional person, driving us couple, mid 60's safely to Ephesus and back. On the drive to Ephesus, he provided wonderful information on Turkey, past and present, and on the local area that we were visiting. At Ephesus, he guided through the site for about an hour, and then, at our request, we had another 90 minutes on our own to fully explore the site and absorb the wonderful atmosphere there. 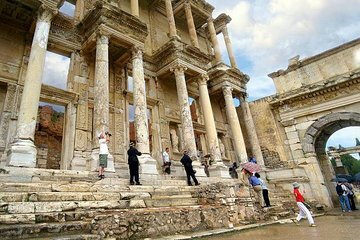 Being with a small group, we were able to see so much more than the larger tour groups, and at our request, we were able to stay longer and not visit a carpet factory - which we had done on a previous tour to Ephesus. Okron was a very helpful, professional, and pleasant tour guide. We would not hesitate in recommending him / or the company for a great tour at a great value. Wonderful tour of Ephasus made even better by our fabulous young guide, Begum. She was such a good conversationalist, and her knowledge was very impressive. Such a pleasant young lady, and a credit to your organisation and Turkey! Great day out, we were guided by Rafir and were amazed at the depth of knowledge he had. Throughout he was genuinely friendly and attentive to our needs, taking us to additional places. I would definitely recommend this trip. My in-laws were booked on this tour. It was the best tour in their stay in Turkey. I would highly recommend. The guide was very knowledgeable and there were plenty of stops for photo shoot.